Sometimes you become so focused on achieving a particular goal that you feel doing anything else during that period is wasting time. 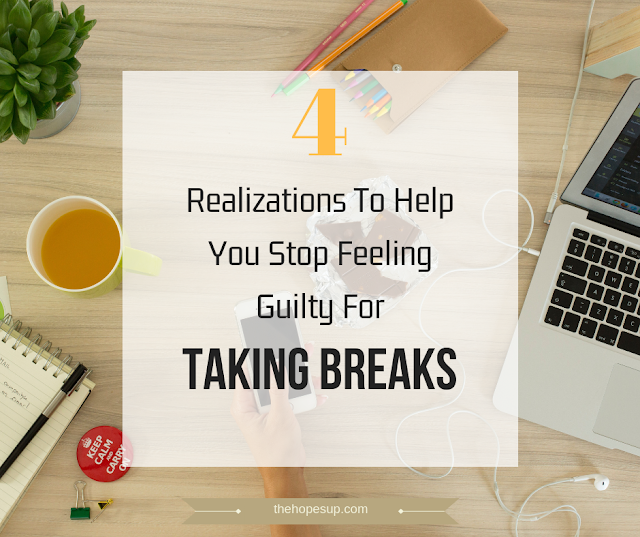 You can’t even think of taking a break without feeling guilty. - You think you are wasting time and you could do more work instead of taking a break. - You believe you are not committed enough and you need to work even harder to reach your goals. - You fear that you will miss your deadline and you want to finish all your work at a stretch. But know that taking a break is actually a crucial part of reaching your goals. Breaks are important to avoid overworking and burnout. A lot of times, it is hard to keep track of time when you are working. You may not realize it but not taking regular breaks is going to negatively affect your health as well. It is important that you acknowledge the importance of breaks and actively remind yourself to calm down and relax while working. If you feel guilty for taking a break from your routine, these 4 realizations are going to help you. 1. You need the right perspective to achieve your goals. And to gain that perspective, you need to clear your mind. When you work long hours or days without taking breaks, you will start feeling overwhelmed, and you will be unable to think clearly. It is essential that you take the time to calm yourself and reflect on your goals. This way you can accurately decide if you’re on the right path. You can review what is working and what is not and make new plans to maximize your efficiency. Continuously working clutters your mind and affects your performance. When your mind is cluttered, you can't accurately decide if you are making the right choices. You can't stay focused if you keep stressing about work without taking any breaks. Prioritizing breaks and taking care of yourself is very important. You deserve to take a break from your usual routine. You need to respect yourself and give yourself time to cope with the work stress. Do not think that breaks are only necessary when you are ill or completely exhausted. You must take the time to relax and treat yourself nicely every now and then. Spend time doing something that you enjoy and stay away from anything work related. Also, when you are on a break, try to solely focus on relaxing, instead of worrying about your work. Continuously thinking about work and deadlines will only drain your energy and make you anxious. 3. Working hard doesn’t always equal working efficiently. Being serious about your goals is crucial, but don't be so hard on yourself and beat yourself up for taking a break. By taking regular breaks, planning with a good strategy, you will get more work done in less time and achieve much better results than continuously working hard without taking any breaks. To ensure better productivity, give yourself the permission to take breaks and relax. Working long hours without taking a break is going to affect your focus and hamper your productivity. To make the most of your time and effort, you need to ensure that you are resting your mind regularly. 4. Happiness is in the process, take the time to enjoy it. You work hard to achieve your goals because you know that it will make you happy. It will make you feel accomplished and proud of yourself. But sometimes you get so stressed about achieving them that you forget to enjoy the little pleasures in the process. You end up postponing your happiness, thinking that when you achieve your goals, only then you can be absolutely happy. You must take breaks, have fun, indulge in enjoyable activities and embrace the happy moments while you work towards achieving your goals. Indulge in some self-care and notice the little things in your life that make you happy. Yes, work is important but it is not the only thing that defines you. You need to take care of your overall health and make time for breaks. You need to take the time to recharge yourself. A break leaves you feeling more refreshed. It improves your productivity and reduces stress. By taking breaks, you work even better and produce more creative ideas. Do you prioritize breaks in your routine? What do you like to do during your breaks? If you found this post helpful, don't forget to share it.